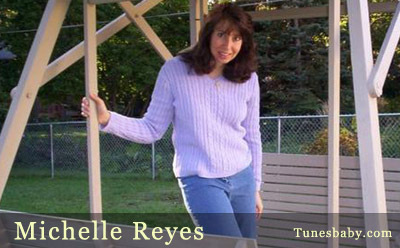 As far back as she can remember, Michelle Reyes always had an intense interest in music and a gift to write songs. She has the ability to feel emotion in such a way that she could accurately portray a particular situation in her songs even though, she, herself, did not experience it. As a 7 year old child she had the innate abililty to recognize that a song consisted of verses, choruses and a bridge just by hearing songs and analyzing them. She began writing several poems in school which later turned into lyrics to songs as she reached her adolescent years. The main themes to her songs were love and dreams. She was a shy teen that didn't fit in very well and found refuge by listening to the songs of the 80's in her room all through High School. She went to college and continued to write lyrics to songs based on her experiences as a young person being away from home for the first time and facing the feelings of independence, romance and self discovery. She used writing as a way to deal with her feelings and emotions and also to escape at times when life got difficult. In her early 20's, she wrote several more songs and this time got a keyboard and began to write complete songs, words and music for the first time. She had organ lessons as a child for 7 years and knew that that background helped her greatly to write the songs. She never had any formal music theory training and learned to write by ear coming up with the chords and plugging in melodies and words. lyrics. She had also pursued writing songs for other artists for awhile. However future endeavors include learning guitar and recording new material in either country, rock or acoustic style. She is looking forward to take a break from her pop/keyboard roots to expand her musical horizon.